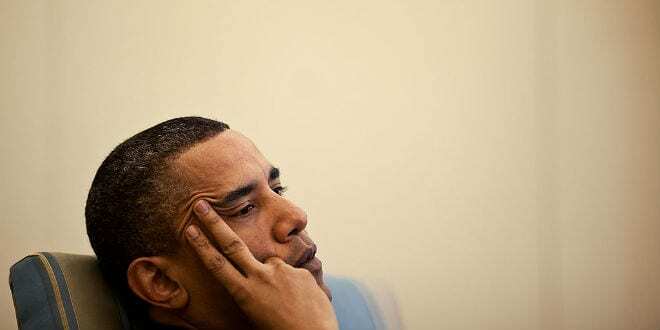 A re-established and self declared Israeli Sanhedrin is calling US President Barack Obama to trial for what it says are “criminal offenses” against the Jewish people following the passage of the Iran nuclear deal. The modern day Jewish high court, made up of 71 Judaic scholars and rabbis, plan to bring the American president to trial on Mount Zion on September 9, 2015, four days before Rosh Hashana, the beginning of heavenly judgement days for the Jewish nation. The Sanhedrin, which has been active in Israel for over a decade, recently made news when it announced that it would be putting Pope Francis on trial in absentia for his recognition of a “State of Palestine”. The original Hebrew letter, with its English translation, sent to the US leader by the Sanhedrin can be read below. Unfortunately, despite international experience in negotiating with totalitarian countries with aggressive imperialist aspirations and abilities throughout history, and especially in the 20th century, you have failed to prevent the agreement with destructive consequences that are inevitable for Israel, the Jewish people, all people of the region, to the United States, and to the West. On the contrary, the evidence of progress in negotiations toward a desired and expected outcome increase every day. Empowering Iran to the level where it would constitute a complete and immediate threat would thrust the entire region into a state of instability including extreme weapons of mass destruction. These actions range from criminal offenses to malicious intent and gross negligence. 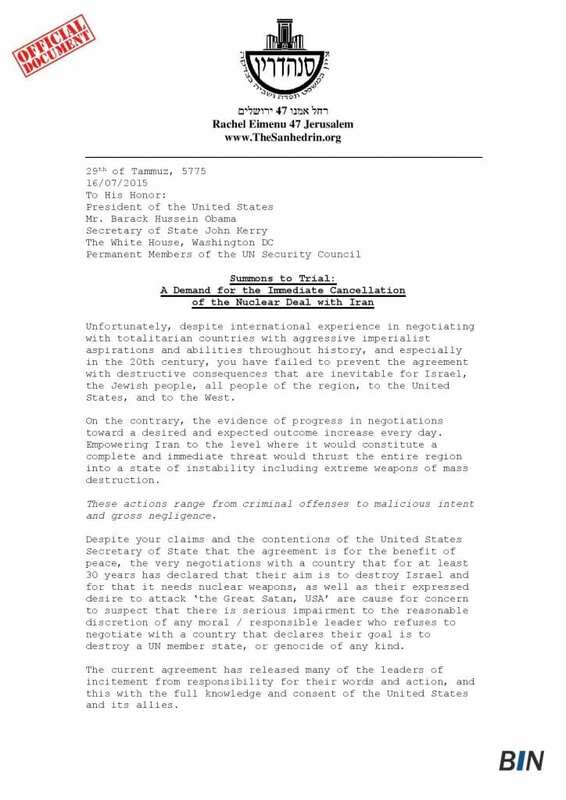 Despite your claims and the contentions of the United States Secretary of State that the agreement is for the benefit of peace, the very negotiations with a country that for at least 30 years has declared that their aim is to destroy Israel and for that it needs nuclear weapons, as well as their expressed desire to attack ‘the Great Satan, USA’ are cause for concern to suspect that there is serious impairment to the reasonable discretion of any moral / responsible leader who refuses to negotiate with a country that declares their goal is to destroy a UN member state, or genocide of any kind. The current agreement has released many of the leaders of incitement from responsibility for their words and action, and this with the full knowledge and consent of the United States and its allies. 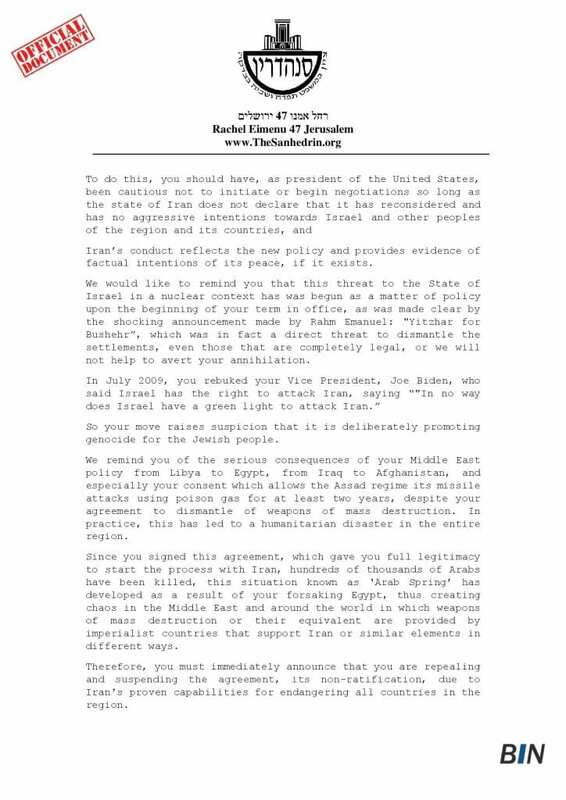 To do this, you should have, as president of the United States, been cautious not to initiate or begin negotiations so long as the state of Iran does not declare that it has reconsidered and has no aggressive intentions towards Israel and other peoples of the region and its countries, and Iran’s conduct reflects the new policy and provides evidence of factual intentions of its peace, if it exists. 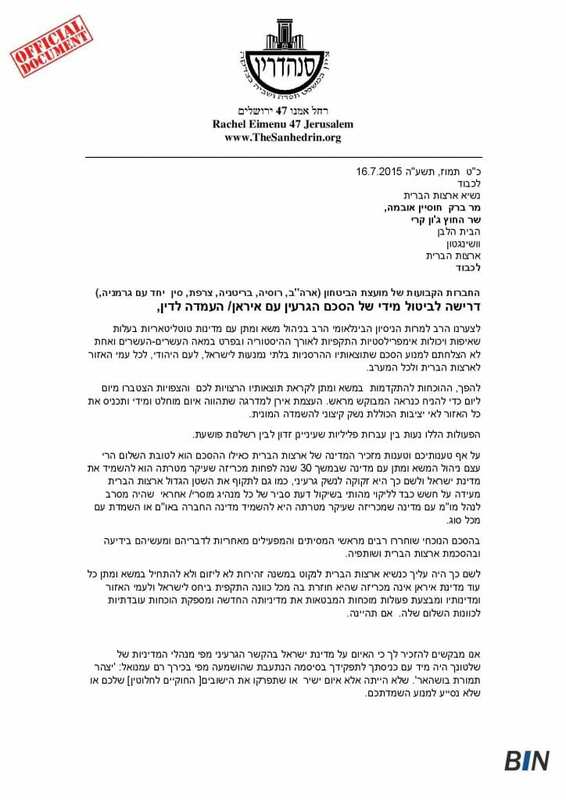 We would like to remind you that this threat to the State of Israel in a nuclear context began as a matter of policy upon the beginning of your term in office, as was made clear by the shocking announcement made by Rahm Emanuel: “Yitzhar for Bushehr”, which was in fact a direct threat to dismantle the settlements, even those that are completely legal, or we will not help to avert your annihilation. So your move raises suspicion that it is deliberately promoting genocide for the Jewish people. We remind you of the serious consequences of your Middle East policy from Libya to Egypt, from Iraq to Afghanistan, and especially your consent which allows the Assad regime its missile attacks using poison gas for at least two years, despite your agreement to dismantle of weapons of mass destruction. In practice, this has led to a humanitarian disaster in the entire region. Since you signed this agreement, which gave you full legitimacy to start the process with Iran, hundreds of thousands of Arabs have been killed, this situation known as ‘Arab Spring’ has developed as a result of your forsaking Egypt, thus creating chaos in the Middle East and around the world in which weapons of mass destruction or their equivalent are provided by imperialist countries that support Iran or similar elements in different ways. Therefore, you must immediately announce that you are repealing and suspending the agreement, its non-ratification, due to Iran’s proven capabilities for endangering all countries in the region. 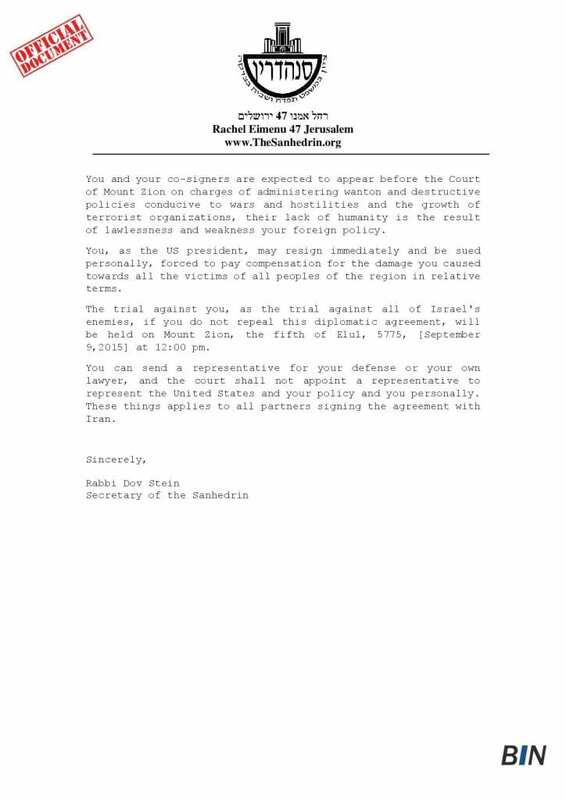 You and your co-signers are expected to appear before the Court of Mount Zion on charges of administering wanton and destructive policies conducive to wars and hostilities and the growth of terrorist organizations, their lack of humanity is the result of lawlessness and weakness your foreign policy. You, as the US president, may resign immediately and be sued personally, forced to pay compensation for the damage you caused towards all the victims of all peoples of the region in relative terms. The trial against you, as the trial against all of Israel’s enemies, if you do not repeal this diplomatic agreement, will be held on Mount Zion, the fifth of Elul, 5775, [September 9, 2015] at 12:00 pm. You can send a representative for your defense or your own lawyer, and the court shall not appoint a representative to represent the United States and your policy and you personally. These things apply to all partners signing the agreement with Iran.